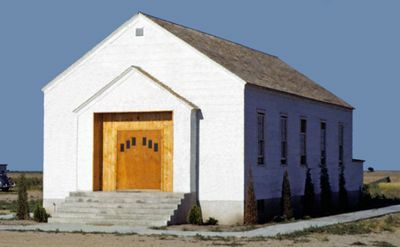 Ingalls Mennonite Brethren Church, located in Gray County, Kansas, five miles (eight km) north of Ingalls, a member of the Southern District, was the outgrowth of an original union or mission church founded in 1923. In 1954 it had a membership of 57. D. W. Siemens, B. C. Willems, G. G. Wiens, William Neufeld, D. J. Wiens, and J. W. Fast have been leaders in the congregation. The congregation no longer exists. Fast, J. W. "Ingalls Mennonite Brethren Church (Ingalls, Kansas, USA)." Global Anabaptist Mennonite Encyclopedia Online. 1958. Web. 21 Apr 2019. http://gameo.org/index.php?title=Ingalls_Mennonite_Brethren_Church_(Ingalls,_Kansas,_USA)&oldid=115609. Fast, J. W. (1958). Ingalls Mennonite Brethren Church (Ingalls, Kansas, USA). Global Anabaptist Mennonite Encyclopedia Online. Retrieved 21 April 2019, from http://gameo.org/index.php?title=Ingalls_Mennonite_Brethren_Church_(Ingalls,_Kansas,_USA)&oldid=115609. Adapted by permission of Herald Press, Harrisonburg, Virginia, from Mennonite Encyclopedia, Vol. 3, p. 38. All rights reserved. This page was last modified on 14 March 2014, at 14:48.